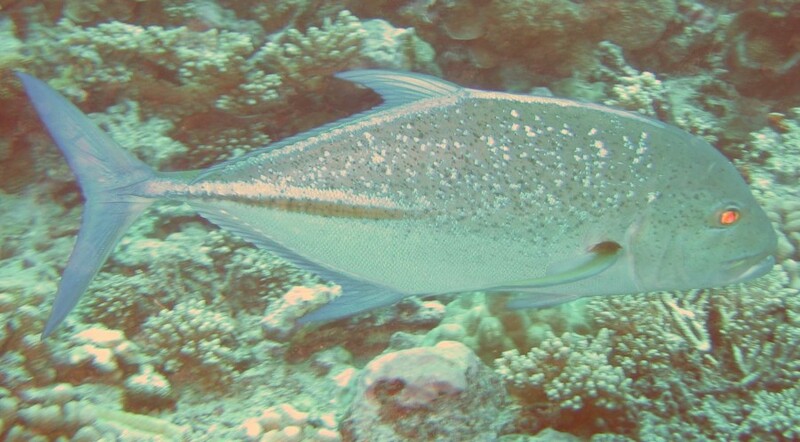 In Fakarava, we were treated to an unusual situation. After we dropped the hook and looked around, we realized we were (by far) the smallest yacht in the anchorage! L'Ondine (Sweden), Bravo Charlie III (Hawaii), and Cowrie Dancer (OZ) were all about 60'. However, all were very friendly, had extra dive gear (including compressors) and all were willing to loan us gear. 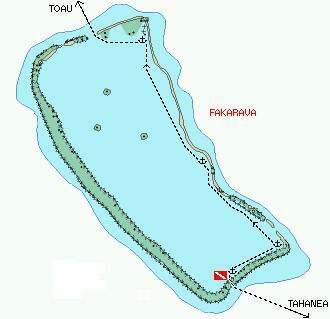 This let us do some drift-dives in the famous Fakarava South Pass. Dive Shop: There is a commercial dive operator at the South Pass associated with the small resort. We didn't use their services, though, so we don't know about rental possibilities or the cost of dives. Fresh Water: There is no fresh water in the Tuamotus except what is caught and held in cisterns, so we used water from our sailboats for rinsing gear. The trick with drift dives of this sort is to catch the current at the right time. Since we were starting in what is arguably the open ocean, we needed fairly settled seas. We didn't want to be spat out into the deep blue sea, so we needed an incoming current. This current doesn't last long in the Tuamotus, as all of the water from the waves breaking over the reef into the central lagoon has to get out through the pass(es). This means that the out-flowing current is much stronger and lasts longer than any inflowing current (if there is one at all). We also didn't want the current to be too strong, just a nice, gentle 1-2kts so we didn't have to work too hard and the scenery drifts serenely by. This usually means that the optimal time is just after high tide, as the tide is turning. Once we saw the current about to turn, we all donned our gear and headed out for the mouth of the pass. Yes, but we didn't use it. LOTS of sharks, down about 90 feet. (Jon) I actually started to dive the SE Fakarava pass 3 times, but one of those times Chris blew out a high-pressure hose on his borrowed regulator, so we had to abort after only a few minutes. But the other 2 dives were fantastic! One of the fun parts of diving with folks from other boats is that they're usually much more experienced than us, so I feel more relaxed and enjoy myself more. My final dive here was with Dale from Cowrie Dancer, who's been sailing and diving for more than 20 years. The previous day we'd been a bit late so we started this dive a bit earlier. We caught the current just right, dropped down to the sand patch at 50' (15m) and let the current push us along gently, seeing lots of big, fat grouper and related fish. We also saw about 50 sharks milling around, mostly 4-7' (1-2m) Black-tipped Reef Sharks. As the central channel got deeper we hugged the right bank, drifting slowly deeper. Here we saw another group of about 10 sharks that were somewhat bigger, just hanging out waiting for dinner to come to them, as well as several large (about 6') tuna-looking fish, gently swimming against the current. I eventually got down to 90' (27m), my deepest dive to date. After a while we turned right towards the dive-dock and the channel to the anchored boats. Here the water got shallower and the current much stronger. Hanging onto the coral, I felt like a flag, flapping in the breeze. The coral in the shallower water was more prolific. The fish got a bit smaller, but there were a lot more of them. This was by far my best dive to date. (Amanda) I was rather dubious about this dive, as it was the first time that I dove since getting certified in Bonaire, six months before. I like diving once I get down there, but the trick is getting me to get to that point. Nonetheless I gritted my teeth and went for it. We were thinking of keeping in a group with the other people, but they got all their gear on and splashed way before we did - lack of practice, I guess. We also had mom in the dinghy actually tow us to the side, where it was not quite as deep. Then we went down. It was actually quite a nice dive, after I got over the fiddling with my gear. There's something about just being down, right there with the coral, the fish, the eels... and if I peered over the edge, I could catch a glimpse of all the reef-sharks milling around in the middle of the pass. I was quite happy to stay above them. However, the tide must have been changing, because I realized that, after a while, I was straining a bit and just not going very fast. Dad was way ahead, with the rope and ball, and I wasn't being able to catch up with him. Twenty minutes (our planned stopping-time) came eventually, and up we went. It was quite a surprise to see just how little we had actually gone. We weren't even at the dive-shop! With the increased current I was quite happy to get back in the dinghy with Mom, but Dad and Chris went back down for about ten minutes, until we saw Chris come up in a blast of bubbles. (Sue, in chaseboat) After our misadventures in the Tahanea Pass where we had divers separated from the chase-boat for far too long, we had Jon drag a small Styrofoam ball on about 100 feet of polypropylene line so that we could keep track of the divers from the surface. The ball was very easy to follow when the water was disturbed. In calm water, however, bubbles were easy to follow.